With so many parks and fun things to explore, Kansas City is a great place to get outside. However, all Kansas City residents know that before they step outside for a fun day in the sun, sunblock is an absolute must. Even on a cloudy day, uv rays from the sun can still give you an awful sunburn. But did you know that you’re still exposed to uv radiation even when you’re not outside. That’s right, even when you’re sitting inside, at home or at the office, your skin is still exposed to uv rays carried in the sunlight that comes in through windows. And not only does uv radiation put your health at risk, but it can also put your personal belongings in jeopardy too. 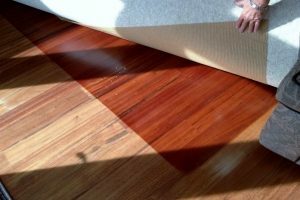 Leather, cloth, carpet, and wood flooring are all susceptible to fading cause by uv exposure and need to be protected from the sun. A simple solution to protecting yourself, your family, and your home from uv rays is installing uv blocking window film for your Kansas City home. With a 99.9% uv blocking ability, window film is a very effective way to protect your home from the sun’s harmful rays while still enjoying the beauty of natural sunlight. Uv rays have long been recognized as a catalyst that causes major health issues. Scientists point to uv rays as the number one reason for the development of melanoma as well as numerous other bodily diseases like cancer, glaucoma, and immune system oppression. Additionally, they are also very destructive to the dyes we use to create color. Artwork, paintings, curtains, flooring, and furniture turn white when exposed to uv rays for a prolonged time period. Wood items like cabinets, rocking chairs, and wood floor panels can also be destroyed by the intense heat and eventually warp or crack. Installing uv blocking window film for your Kansas City home is a surefire way to guard your family and your belongings from uv rays. Uv blocking window films have an effectiveness of 99.9%, meaning they block everything but .1% of uv rays. They’re a great way to ensure that your home and your loved ones stay safe from the sun. At Green Light Window Films, we carry multiple styles of uv blocking window film so you can find the perfect film to match the look of your home. Call us today to schedule a consultation or receive a quote on uv blocking window film for your Kansas City home.